Opah is a well-known fish, that given its body design and preference to dwell in cold deep-water habitats, was assumed to be lethargic-esque and slow-moving like other deep sea denizens. 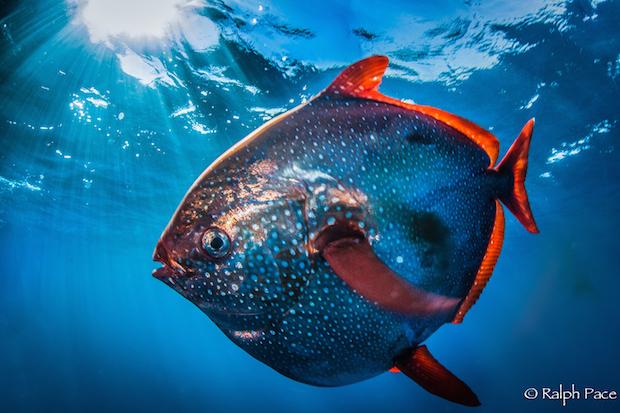 Scientists at NOAA stumbled onto the realization that this fish was warm-blooded when observing the gill tissue of opah. They found that blood vessels carrying warm blood into the fish’s gills wind around those carrying cold blood back to the body core. This design is known as counter-current heat exchange, and is similar in function to a car’s radiator. This design allows warm blood leaving the body core to help heat up cold blood returning from the respiratory surface of the gills. This natural heat conservation adaptation allows opahs to maintain an elevated body temperature despite the colder ambient sea temperature. This is unlike anything ever observed in fish anatomy! Realizing that opah’s are warm-blooded completely changes the way sceintist view life history strategies of this unique fish. Once thought of as slow, ungainly predators, in reality opah’s are swift, actively chasing down and feasting on agile deep ocean prey like squid. You can view more details this stunning study in the journal Science.